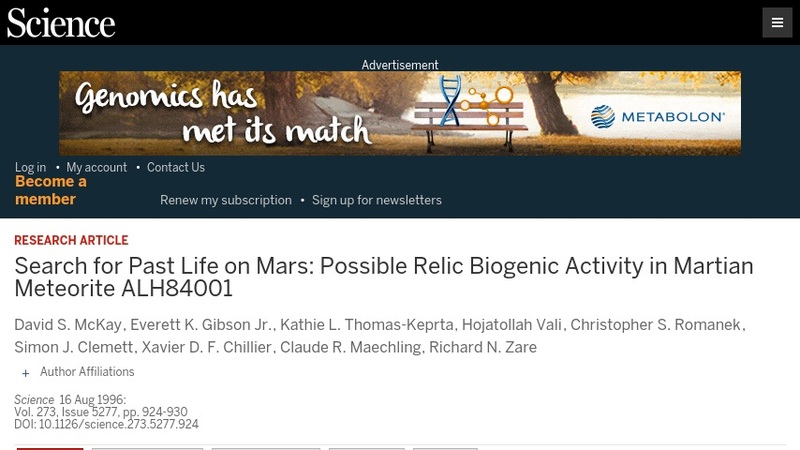 This Science magazine article documents possible evidence of nanofossils found on Martian meteorite ALH84001. The research team, led by NASA's David McKay, found carbonate globules that are similar to those found in some terrestrial bacterially induced carbonate precipitates on Earth. Polycyclic aromatic hydrocarbons (PAHs) and secondary minerals and textures in the meteorite provide further evidence of past Martian biota. The article features color photographs and graphs as well as links to a collection of articles that cite this paper. A subscription may be required to access the full text.